"You," Kazuo Ishiguro writes in the opening of his latest novel, 'The Buried Giant,' "would have searched long time for the sort of winding lane or tranquil meadow for which England later became celebrated." You — the reader — will quickly twig to the fact that there is a teller of this story. Someone may be remembering their life; perhaps you. Memory is much in the mind of our storyteller in 'The Buried Giant,' or the lack thereof. The story unfolds in post-Arthurian, pre-Saxon Britain. Axl, and his wife Beatrice, are an aging couple, old enough to be forced to live on the outskirts of what might be called a village. They are not permitted to have a candle; it is feared they will tip it over and start a fire. This is not their greatest worry. They are losing their memories, not as a result of aging, or so we are told, but rather because a mist has settled over the village, over the world as they know it. Ignoring Faulkner's admonition, the past has died, and with it, the stories it held that defined Axl and Beatrice. They decide to leave their village in search of their son, hoping that in finding him their memories will be restored, in particular those of their love. They set off into a landscape of magic, ogres, spells, and dragons — the human imagination, unfettered by all that we have learned. Ishiguro's prose drives the story. It's crisp, concise and elegiac. You'll want to read it aloud, or you will her it read aloud when you read. This is not the stripped down scientific prose of 'Never Let Me Go.' This is more what you might hope to find in a re-telling of the Greek Myths, or the Odyssey. In fact, 'The Buried Giant' is very much like a sequel to Homer's epic. There's a stately feel to the telling, even down to the narrator who wavers in and out of the story. Ishiguro manages to write with a beautiful, wistful longing that is simultaneously muscular and propulsive. By virtue of the road novel structure, the plot is episodic but compelling. As does Odysseus, Axl and Beatrice face a variety of perils on their journey. Ogres, monsters and warriors all present different dangers on the surface, even as they evoke deeper, more complicated emotions. Ishiguro crafts a very naturalistic world of the supernatural that creates tension and suspense, but he's ever acutely attuned to the resonance of his imagery. While readers speed along in an adventurous plot arc, deep beneath the surface, Axl, Beatrice and those they meet are casting shadows, tugging at our subconscious. 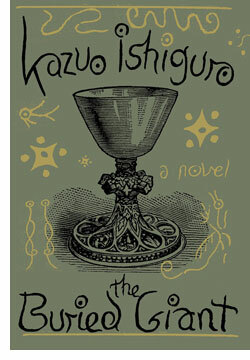 Make no mistake; Ishiguro crafts some great monsters to populate this world. Axl and Beatrice meet a variety of great characters and encounter creepy, unsettling encampments along the way. But for all the incident and excitement he offers, Ishiguro is operating the realm of myth. He's using the literature of the fantastic to explore not a world he's built, but the worlds that already exist inside his reader's minds. Ultimately, 'The Buried Giant' is a love story, about the stories we tell ourselves to define ourselves in context to those with whom we share our lives. Axl and Beatrice are in search of their memories, and they realize that they may not like what they find. Axl may not be the frail old man he sees himself as now. Beatrice may not be his content wife of many years. Their world will be crafted with words, as yet undiscovered. In 'The Buried Giant,' readers will discover worlds as well, and not simply the fantastic one Ishiguro offers. As the mist clears from our memories, we may realize that we haven't left those monsters behind, that something lurks inside of us, unfettered by all we hope to have learned.